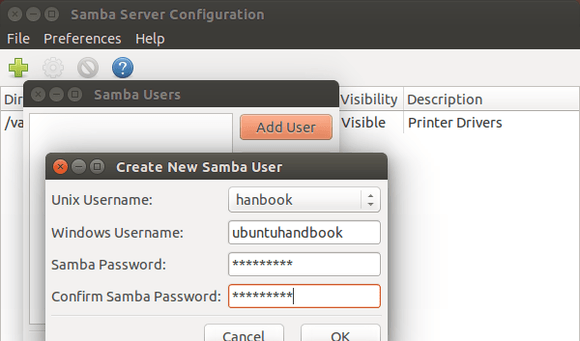 This tutorial will show you how to install and configure Samba, a free software that allows you to share files, printers and other common resources across a network, in Ubuntu 14.04 Trusty Tahr. 3. When the tool opens, go to Preferences -> Server Settings. Workgroup. Same to your Windows Workgroup name (case-sensitive). In Windows 7, right-click Computer icon and go to Properties, there you’ll see Windows Workgroup name. Description.This is the name of your computer as seen by Windows Users. As it is not advisable to allow ‘Guests’ there should be no reason to change the ‘security’ settings tab unless you wish to do so. Finally click the OK button to save it. Go to System Settings -> User Accounts -> Click unlock -> Click + (plus) icon -> Choose Standard account and type in names. Remember to set a password to enable the new account. Windows Username: When accessing from Windows machine, you’ll be asked to type this username and the password below. Samba password: When accessing from Windows machine, you’ll be asked to type the username above and this password. Finally, restart Samba service and done! 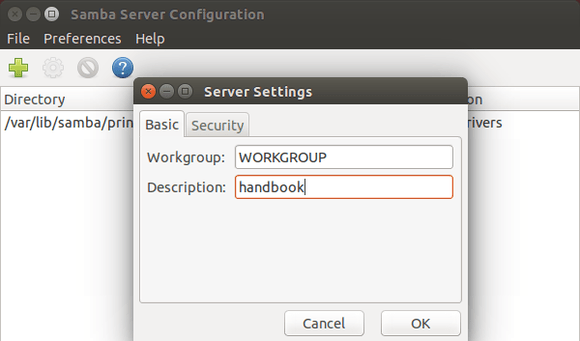 To share a folder, click the green + (plus) button in Samba Server Configuration tool and you can then easily set the directory, name, read/write permissions and access users. Tips: If you set the Unix Username to current login user in step 5, you can easily share a folder by “Local Network Share” option in its context menu. If the error still exists, you must have installed something that conflict to samba in default Ubuntu repositories. Do you know how to fix this error? ‘net usershare’ returned error 255: net usershare add: share name games is already a valid system user name Thank you. Thanks, it worked perfectly. My Ubuntu system was not accessible by name but got it through the IP. Worked per your instructions. This was on a home (wireless) LAN with a Mac Book Pro and Ubuntu 14.04. Thank you for your help/article. It is not the first one that I have used with no difficulty. It’s not working for me. I followed this step by step and also tried doing it directly from the terminal. Does the Windows username have to be equal to the username I specify? I am following step by step, and when “password required for workgroup” window appears n i insert password workgroup windows, its nothing, can you help what wrong with my setting? ofcoure, the problem just time in both of Comp must be same..
Had same issue. Shut down all programs and reboot. Should see icon now in Applications. Thank you so much Ji m. You helped a lot with your article. I’m using Ubuntu 14.04LTS amd64 on my notebook and Windows 8.1 Pro x64 PC Desktop, and now I can share my files easily at home. Installed samba as said. 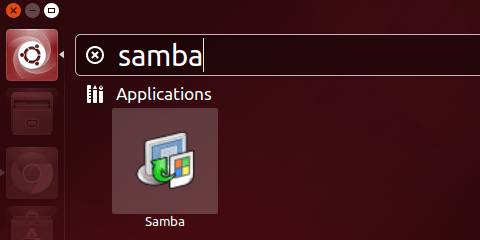 Samba is not even opening up! why? thank you! your article works like magic on me…. Is not really working. Did all the settings, but when I tried to open the folder from a Windows client from the lan, it does not recognize the username and password. I appreciate the time you put in to help but, it is not really working. Didn’t work for my LUbuntu…it doesn’t have the unity dash…if i open it thru system tools…it ask for password…upon entering the password, it will just close and open nothing…. Any help/suggestion on how to proceed is highly appreciated. Thanks. That’s works for me! how to access a kernel of one ubuntu system in another ubuntu system? I am trying to connect shared folder from my other computer in my local network. My other computers is running windows 7 and windows 10. Also I see shared Ubuntu folders in other computers under windows. when in nautilus file browser connect button is disabled. Hello are you getting any solution for your problem, because i am also suffering with this problem. Plz let me know if your have any solution. I have been searching everywhere and tried several tutorial. None of that work. Until I read this article then the problem get solved. I’m using Ubuntu 16.04 by the way. Hey guys, there is one step missing in the tutorial. If you are installing this for the first time, after you launched the samba and key in the administrative password, nothing will appear. You need to create a blank file in order for the GUI tool to work. Open the terminal (Ctrl+Alt+T) >> sudo vim /etc/libuser.conf >> Don’t add anything, just save it as empty file. when trying to run gksu from terminal!